When will I learn? I need to make sure a restaurant is actually open, or in this case still in business, before we trek all the way across town. 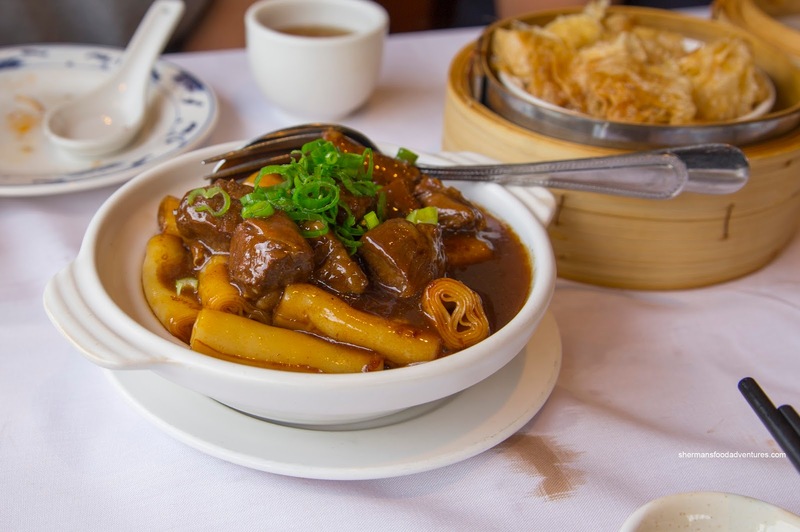 After Sunday hockey, we thought that hitting up Moon Cafe on Fraser for some HK-style cafe food would be a good idea. Wrong. We were greeted with a sign explaining that the place will now be replaced by a Vietnamese restaurant. Fail. 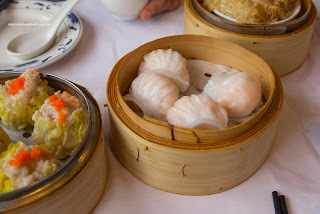 So off we went down a block over to Good Choice for some backup Dim Sum. I've been here before and yes really, it was a good choice. 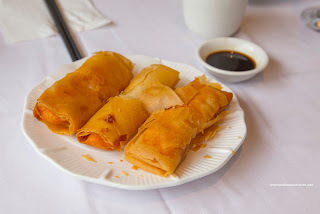 We started with the Shrimp Spring Rolls which were served super hot and crunchy. Despite the fairly thick exterior wrap, the entire roll was fried masterfully with defined layers. By virtue of proper oil temperature and draining, the rolls were not greasy. Inside, the whole shrimp filling maintained a buttery snap while seasoned aggressively. 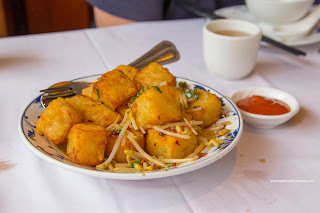 Next up was the Fried Daikon Pudding with XO Sauce. Not too soft while not too firm, the cubes of daikon pudding were not crispy on the outside. Despite this, the wok toss in XO sauce and proper wok heat allowed for caramelization of flavours in addition to some spiciness. I liked how the dish wasn't overly greasy despite the deep fry and subsequent stir-fry. Onto the standards, the Haw Gow (Shrimp Dumpling) and Sui Mai (Pork & Shrimp Dumpling) looked the part. For all intents and purposes, they played the part too. Although a bit small in size, the haw gow featured whole shrimp filling that was buttery with a cold-water snap. It was well-seasoned with flavours that trended towards the sweeter side. I got the essence of sesame oil as well. Although oversteamed and sticky, the dumpling skin was not overly thick nor doughy. I actually felt the sui mai was even better with a 50/50 ratio of crunchy shrimp and bouncy pork. 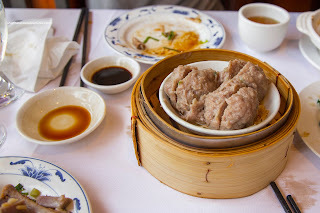 Again, the dumpling was well-seasoned with balanced savoury and sweet flavours. 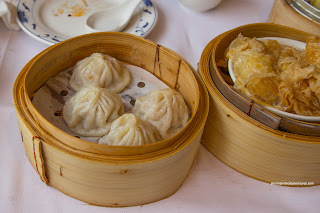 We gave JuJu a hard time about ordering the Xiao Long Bao and Chiu Chow Dumplings since being a Cantonese restaurant, the chances of these dishes being good were low. So it was no surprise that the XLBs featured a somewhat thick and doughy dumpling skin. With that being said, it wasn't too bad in relation to other dim sum joints. There was actually a small amount of soup inside to compliment the tender meat. It was mostly sweet without the classic ginger and wine flavours. 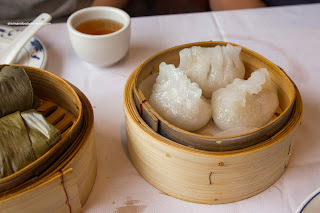 As for the Chiu Chow Dumplings, the skin was really thick and sticky (it generally is, but overly so in this case). Inside, the filling was fairly loose and consisted of dried turnip, dried shrimp, water chestnuts and green onion. Strangely, there were no peanuts. With the ball jokes flying at the table, we of course had the Beef Meatballs. These were processed to the point where they were soft and only a touch meaty. Usually, I prefer the meatballs to be a little less buttery, but I didn't mind these ones as they weren't mushy either. They were lightly seasoned where a bit more green onion would've helped diversify the flavours. 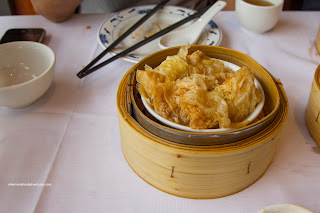 Onto the Bean Curd Skin Rolls, we found them to be quite good. Most times, I find that the bean curd wrap to be overly wet and soggy. It wasn't in this case as it still exhibited a bite and appealing chewiness. There was a minimal amount of sauce that kept things less goopy. Inside, the filling was mostly pork that was moist with some natural textures. To ensure our fullness, we got 2 filler items including the Pork Spareribs on Rice and Rice Noodle Rolls with Brisket. 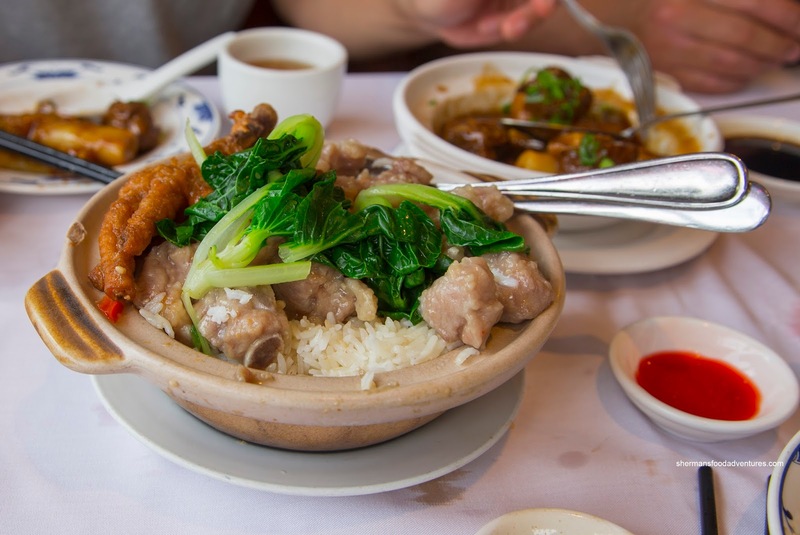 We could barely see the rice due to the generous amount of spareribs, baby bak choy and chicken foot on top. However, the rice itself was a bit too wet and that became even more evident when mixed with the sweet soy. The spareribs were good though with a tender rebound texture while properly seasoned with lots of garlic. Onto the rice rolls, they were pretty firm which was a good thing as the starch-thickened sauce added lots of moisture. Although dark in colour, the sauce itself wasn't overly salty while the brisket was generally tender with a touch of chewiness. To further drive the point home about adding filling items, we had the Lo Mei Gai (Sticky Rice) as well. 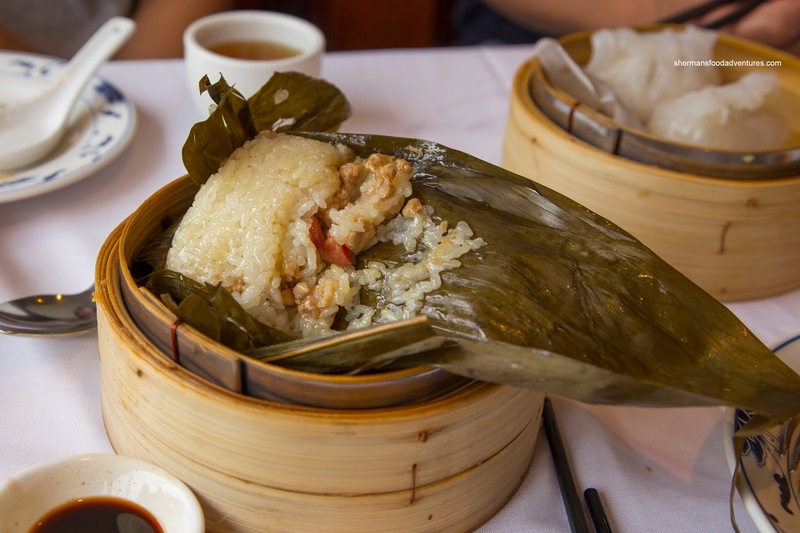 Served as 2 rather than 3 wraps, the sticky rice retained more moisture. Hence, the rice was a little soft, yet still appealingly glutinous. There was an adequate amount of ground pork filling with Chinese sausage. The flavours were mild which allowed the aroma from the leaves to come through. 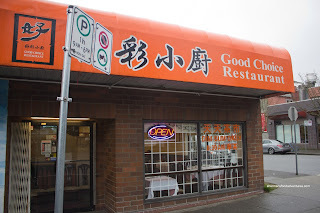 In the end, it was a good choice to visit the restaurant with the same name, not because it was a last minute backup decision. 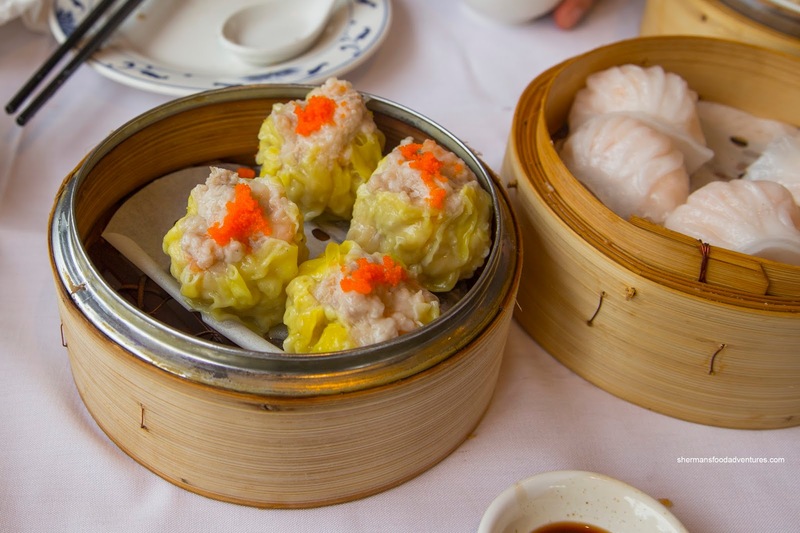 Rather, it should've been our first choice due to the reasonably-priced and well-prepared Dim Sum.
" ..... we thought that hitting up Moon Cafe on Fraser for some HK-style cafe food would be a good idea. Wrong. 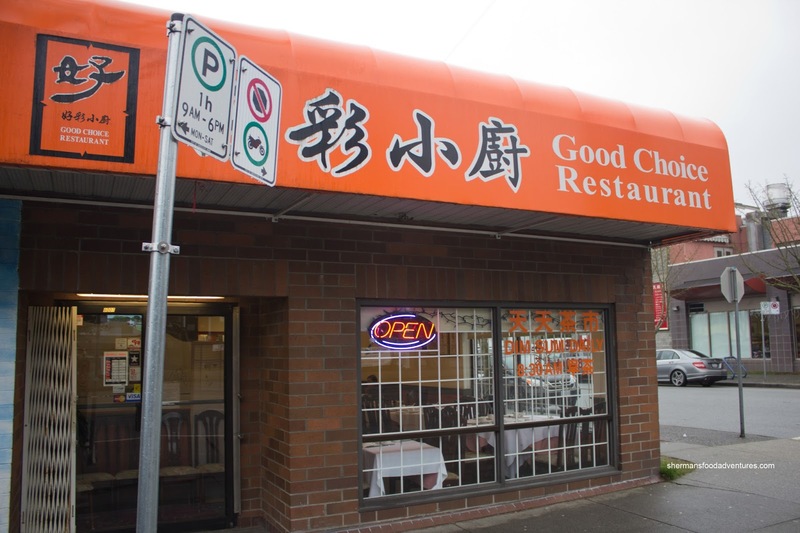 We were greeted with a sign explaining that the place will now be replaced by a Vietnamese restaurant." You could have gone to Angel Cake Cafe (HK) right across from Good Choice ! We like Angel Cafe. But it is too pricey in our opinion, much better less expensive options.